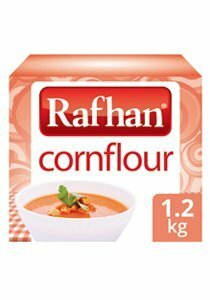 Rafhan Corn Flour is used for thickening gravies and soups to the right consistency. It is also used in coatings for frying application. Contains Sulphite (=/> 10 mg/kg). • Take 1 tablespoon of cornflour and mix with 4 tablespoons of water to make a paste. • Add paste to gravy and stir the mixture well with spoon at a low flame. • Repeat step 1 & 2 if thicker gravy is required. Now gravy is ready. • Add 1/2 cup cornflour in 1/2 cup flour, add a teaspoon of baking powder & mix well. • Gradually add a cup of water and 1 tablespoon of cooking oil in the mixture. • Now coat the food (chicken/meat/vegetable etc.) with the mixture and fry. Ambient (Store in a cool and dry place). Use lukewarm water for the quick dissolving.